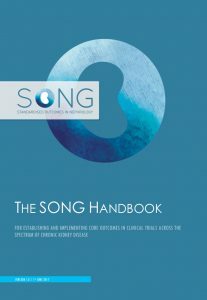 Download your copy of the SONG Handbook (Version 1, 1st June 2017) for establishing and implementing core outcomes in chronic kidney disease. Evangelidis N, Craig JC, Tong A; SONG Executive Committee and Investigators. Standardised outcomes in nephrology – haemodialysis (SONG-HD): using the Delphi method to gain consensus on core outcomes for haemodialysis trials. Hanson CS, Gutman T, Craig JC, Bernays S, Raman G, Zhang Y, James LJ, Ralph AF, Ju A, Manera KE, Teixeira-Pinto A, Viecelli AK, Alexander SI, Blydt-Hansen TD , Dionne J, McTaggart S, Michael M, Walker A, Carter S, Wenderfer SE, Winkelmayer WC, Bockenhauer D, Dart A, Eddy AA, Furth S, Gipson DS, Goldstein SL, Groothoff J, Samuel S, Sinha A, Webb NJA, Yap HK, Zappitelli M, Currier H, Tong A. Identifying important outcomes for young people with chronic kidney disease and their caregivers: a nominal group technique study. American Journal of Kidney Diseases. (Accepted 2nd January 2019).